Sen. Sherrod Brown (D-Ohio) listens to farmers and small-business owners in Perry, Iowa on February 1, 2019. There are a lot of Democrats with presidential ambitions in 2020 and many of them are already making trips to Iowa. This cycle, at least some Democratic candidates are trying hard to win over rural supporters who were largely ignored in 2016. As heard on NPR's Weekend Edition 2/9/2019. Ten farmers and small business owners sit around a table at the public library in Perry, Iowa and talk with Ohio Senator Sherrod Brown. He’s getting their perspective as he mulls whether or not to run for president. He’s able to partake in farm country small talk like the price of farmland these days. “With commodity prices down does that dollar figure drop?” Sen. Brown asks the farmers. “A little,” they reply. In his first trip to Iowa, Brown mostly made stops in counties that voted for President Trump in 2016. During this roundtable he heard their concerns about the president’s tariffs and other issues like rural hospitals losing services and kids leaving the farm and not returning. Brown says Democrats need to pay more attention to rural America. Farmer Warren Varley was happy to have the senator visiting and hopes other candidates stop by small towns like Perry or Stuart, where he farms. Sen. Elizabeth Warren (D-Massachusetts) speaks to a crowd in Storm Lake, Iowa on her first trip to Iowa after announcing her exploratory campaign for president. She's next to Mark Prosser, Storm Lake Public Safety Director (left) and Buena Vista County Democrats chair Jim Eliason (right). 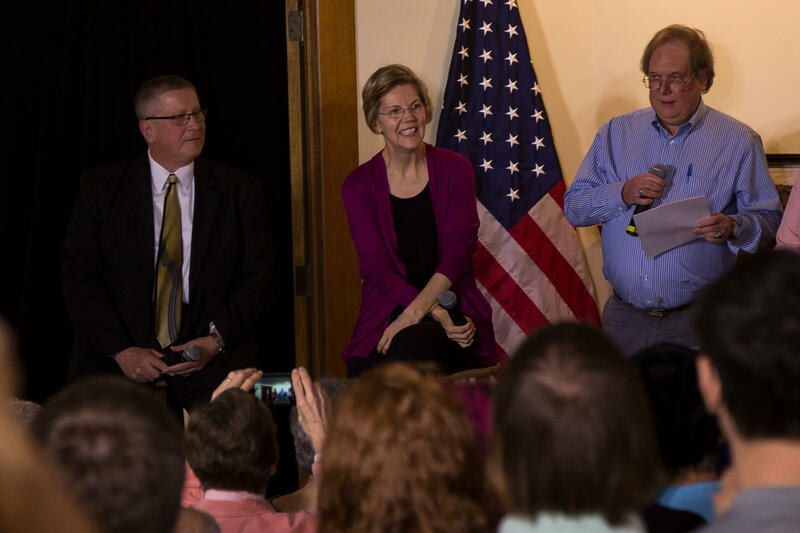 Warren’s first Iowa trip in January included a stop in Storm Lake: a town of less 11,000 people.The line was around the block and many couldn’t get in. “I’m actually surprised that Elizabeth Warren found Storm Lake on the map,” Barbara Stroud said with a smile as she stood outside waiting to get into the venue. “I’m leaning so strongly Democrat that I’m ready to topple over, so I’m considering [caucusing]” Sally Dobson, who identifies as an independent voter. Many of those in line weren’t talking about the price of corn and beans. They were discussing issues like making healthcare more affordable and combating climate change. Those who got inside heard from Storm Lake’s Public Safety Director Mark Prosser. He talked about the city’s immigrant population. Warren accused Republicans of using immigration to divide Americans. Bob Leonard is News Director at KNIA/KRLS in Iowa. He says paying attention to small town voters was part of former president Barack Obama’s successful strategy ahead of winning the 2008 Iowa caucuses. Leonard interviewed Obama twice and says Hillary Clinton, who barely won the caucuses in 2016, rarely came to rural Iowa. Obama went on to win 53 of Iowa’s 99 counties in the 2008 general election. Republicans have steadily gained ground since then. Hillary Clinton only won six of Iowa’s counties. Now, the question is whether all of these candidate visits are a sign that Democrats could gain back some of that support they’ve lost.